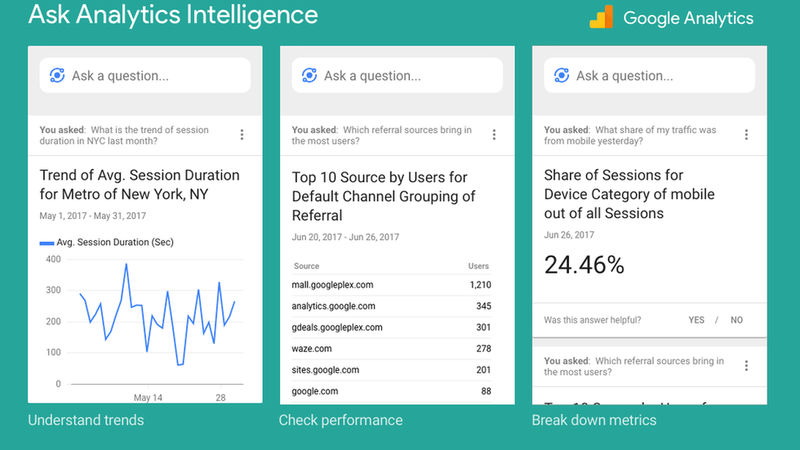 Google is bringing "Analytics Intelligence" (its marketing analytics machine-learning tool) to users on desktop and within its Analytics mobile app. They're also launching an "ask a question" feature that gives users the option to speak their questions. Analytics Intelligence will also surface new metrics that can show spikes in key areas, like revenue or session duration, and help users optimize their marketing campaigns in response to those changes. Why it matters: Google is hoping the new features will make it easier to answer marketers' questions about their ad campaigns in real time, which will drive further engagement with their Google Analytics platform and app. After the addition of Analytics Intelligence, Google says use of Analytics mobile app increased 55% in a year. They also hope the tool will make it easier for marketeers to understand more complicated analytics insights around some of the machine learning technologies available on its platform, like automated insights and smart lists.